Welcome to Trigger Point Self Care for the Abdomen! To continue you will need to agree to the terms of the Disclaimer and Release for this class. To complete this course you will need to purchase and download a copy of The Trigger Point Therapy Workbook: Your Self-Treatment Guide for Pain Relief, 3rd ed, by Clair and Amber Davies. OR you can use a copy you have. This will be a text that we will use in many of our classes. In our experience teaching in the massage classroom, The Trigger Point Therapy Workbook was one of the most valuable texts for our students’ self care. One might want to call this course Health and Wellness for the Massage Therapist. You may download an electronic book or use the paper text from any source that you find convenient. Below is a link to order the text from the publisher. Remember to download the free PDF files of the pain guide. Because e-books have different page numbers, depending on the device you are using, we will refer to chapters and sections headings in order to guide you to the right part of the textbook or PDF supplement. When we refer to page numbers, we will be referring to the paper copy of the 3rd edition. 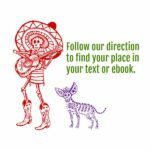 Look for these two to help you find your place in your paper text or ebook. This link will open in another window.